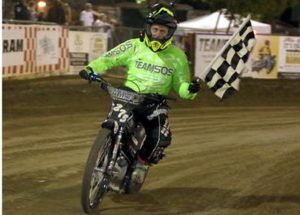 National speedway champion Billy Janniro continued his win streak at Fast Fridays Motorcycle Speedway in Auburn Friday night picking up his fourth scratch main event of the 2018 season. This week Bart Bast did not make it easy for Janniro though giving him his toughest workout in the scratch main this season. Bast nearly knocked the champ off with his skilled and cunning attack. In the race along with Janniro and Bast were Tommy Hedden and Ryan Bast. For Hedden of Auburn, it was his fourth appearance in the scratch main events this season. 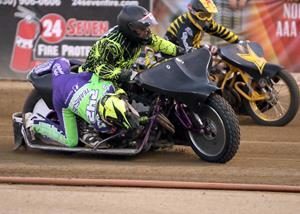 Fast Fridays referee Steve Lucero called for a restart after the riders bunched a little on turn one. After a restart in which Hedden went down in turn one the race was on. Bast, out of lane one got a great gate and was on Janniro’s back. 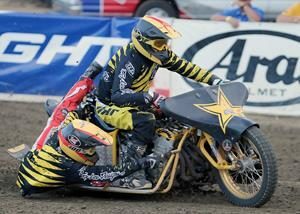 In one of the best races of the night Bast and Janniro put on quite a show. Showing he had the moxie to hang with Janniro, Bast tried it all with Janniro countering with his best defensive moves. Able to hold on Janniro barely kept Bast behind him and beat him to the finish line in a very close race. 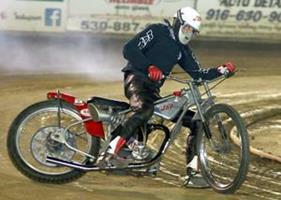 It was the closest any rider has come this season to beating Janniro in the scratch main event. Bast was second, Ryan Bast was third and Hedden fourth. In the handicap main event, young rider Blake Borello was having a great night with a big win. Already having won the Division II main event coming into the race, Borello doubled up with the handicap main event win. The seventeen year old Georgetown resident won his handicap heat, finished second in his semi and took the main event riding off the 10 yard line. Tyler Warren was second and Russell Green was third. In the Division II main event, Borello was first, Matt King was second and Sammy Tetrault was third. Ray Holt Jr., won his first main event of the season in Division III. Holt and Peter Pecorilla who go at it each week in Division III again were in front. Holt finished first, followed by Pecorilla in second and Sammy Tetrault riding in both Division II and Division III was third. In a new program at Fast Friday’s this year the exciting 2018 Team SOS –Team Challenge continued with Round 2. Coming into round 2, Team SOS held a 10-8 lead over Rocklin Harley Davidson. Six riders in pairs of two from each team square off in three scratch races scoring 3 points for a win, two for second place, one for third and zero for fourth. 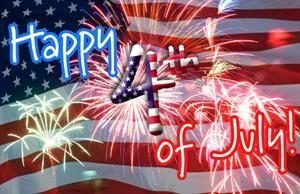 For Team SOS Tommy Hedden and Russell Green notched wins, and for Rocklin HD Bryan Yarrow scored a win. 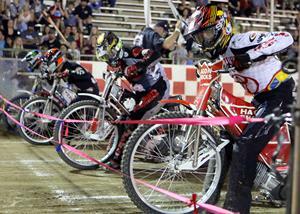 Team SOS held on to the lead in the series scoring 11 points and Rocklin HD scored seven. After two rounds the score settled at 21-15 with Team SOS still leading. Four more rounds remain before the series championship on September 22. 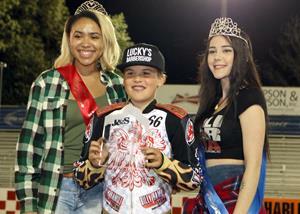 Cameron Krezman cruised to a win in the Youth 250cc main event, his second for the season. Krezman had a perfect night winning his two heat races and the main event. Landon Norton was second and Aidan McNutt was third. 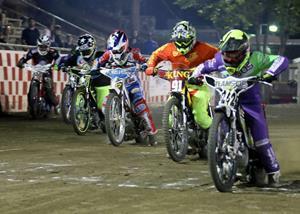 Charlie Trana was the Youth 150cc main event, followed by Mason Zebroff in second and Nick Hohlbein was third. 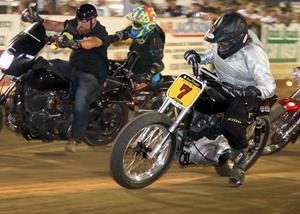 Billy Janniro continued his winning ways with his fourth scratch main event win in a row this season. Janniro has won all scratch main events this season. Georgetown’s Blake Borello won both the Division II and handicap main events. Cameron Krezman (near) lines up for the Youth 250cc main event Friday night at Fast Friday’s Motorcycle Speedway. 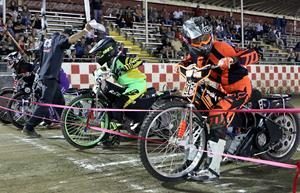 On the winner’s podium for the second time this season Cameron Krezman celebrated his Youth 250cc main event Friday night. 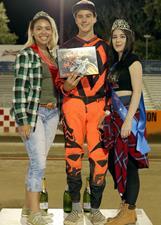 Charlie Trana celebrates his Youth 150cc win with the Fast Friday’s trophy girls. Racers line up for a restart during the Division II main event. Blake Borello (third from right) won the event. 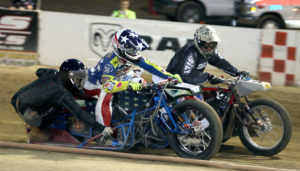 Bart Bast (near) and Billy Janniro (second from right) line up for the start of the scratch main event Friday night. Bast and Janniro put on quite show with Bast challenging Janniro for the win. Janniro came out on top for the fourth week in a row with Bast finishing second.